Last week, The Grind Line discussed the Red Wings’ potential first-round playoff opponents. Perhaps we got a little ahead of ourselves, as the team still has quite a bit of work to do in order to clinch their 25th consecutive ticket to the playoffs. Below we highlight three areas the Red Wings need to improve to stretch from 24 years to 25 years. In order for the Detroit Red Wings to reach the playoffs for the 25th consecutive season, Jeff Blashill and the team will need to solidify their inconsistent defense and goaltending. Up until a month ago, the Red Wings’ goaltending had been the bright spot of the season. Well, Petr Mrazek, had been the bright spot. Former starting goalie Jimmy Howard could not find his confidence or game for the majority of the season. Now, Howard is playing well and Mrazek has been struggling as of late. The past two games, Mrazek played well enough to get the victory, but he’ll need about 14 more strong games to finish out the season and lead the Red Wings to the playoffs. On the back-end, the Red Wings will need to play strong defense as a six-man unit, especially with the absence of Niklas Kronwall. For the next one-to-three weeks, Blashill will need to play the right players at the right times without his workhorse. There is some silver lining to losing Kronwall, though. When Kronwall was out earlier in the season following knee surgery, the defensive pairings seemed to click, especially the Brendan Smith-Mike Green and Danny DeKeyser-Kyle Quincey units. When Kronwall returned, Blashill searched for the right combinations, but never found consistency. Now that he’ll miss the next few games, Blashill will have to find consistency in what he has, likely meaning Kronwall will be paired with Jonathan Ericsson or Alexey Marchenko upon his return. If the Red Wings can consistently turn out strong defensive games, they’ll be in good shape heading toward season’s end. They’ll need this defensive aptitude if they indeed make (and want to advance in) the playoffs, anyway. After finishing the 2014-15 season with the second best powerplay percentage in the league, Detroit has struggled to find similar success this year. It’s a seemingly inexplicable drop in production—cue “Wings miss Babcock” talk—where Detroit sits 23rd in the league, scoring on just 16.8% of their powerplay opportunities. For a team that finished second in the league last season on the man advantage, the addition of powerplay quarterbacks Mike Green and Brad Richards on July 1st should have seen an increase in production, not a significant decrease. The simple fact is powerplays are supposed to lead to goals and in Detroit it’s only led to headaches and frustration, mixed in with a couple of surprising goals. On the other end of the spectrum, Detroit hasn’t been any better; ranking 20th by killing off just 80.7% of penalties. 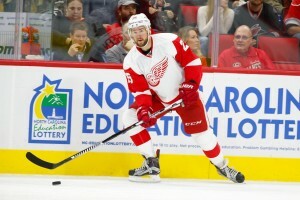 Now its true that Drew Miller is undoubtedly Detroit’s top penalty killer, but he’s of no help right now, nor has he been with season ending knee surgery. No PK should live or die by one player, especially when possible replacements are Darren Helm, Luke Glendening or Justin Abdelkader. Not to mention the formidable work of rookie Andreas Athanasiou or depth center Riley Sheahan, who tallied Detroit’s league-worst, one—yes, one—short-handed goal on the year. At least it was a nice one. Detroit doesn’t need more short-handed goals to be relevant, but they do need to pick up the slack when the team takes a penalty, which has been far to regular in recent games. There is a battle for the last two wild card spots in the Eastern Conference and the Red Wings are right in the thick of it. The Philadelphia Flyers are surging right now (7-2-1 in their last 10 games), while the Pittsburgh Penguins will be without Evgeni Malkin’s services for the next 6-8 weeks. Putting the storylines of other teams aside for a moment, the Red Wings need to take charge of their own playoff push by generating more offense. Simply put, Detroit’s core players aren’t scoring enough and the team’s secondary scoring is going to have to chip in with some big goals down the stretch. Games like the one on Saturday afternoon against the New York Rangers are a reminder that this team needs goals wherever they can get them. 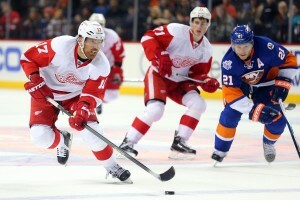 Brad Richards scored the game-tying goal with 32 seconds remaining in the third period and Darren Helm scored the game winner in overtime. The next 13 games are going to be a grind and the Wings will need performances like that again. Throughout the month of February, Blashill leaned heavily on his top line of Zetterberg-Datsyuk-Abdelkader. On March 10th, the Wings’ head coach decided to toss the lines into a blender and came out with a revamped lineup for the game against the Winnipeg Jets. So far, the changes haven’t exactly sparked the offense, but playing alongside Datsyuk gives a player like Andreas Athanasiou a chance to flourish. If the Red Wings can get some of their younger talent and role players going, they’ll have a much better chance at clinching their 25th consecutive playoff berth.